Join this Arctic adventure to the remote regions along the dramatic coastline and to the most northerly part of Norway. Much of the duration of this eventful voyage is spent above the Arctic Circle, increasing your chances of seeing the Aurora Borealis. 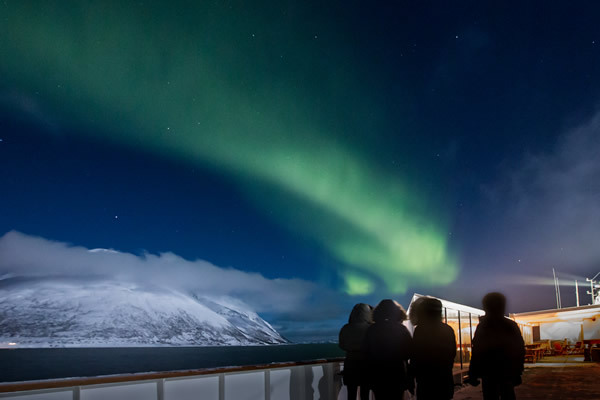 Be part of this popular Hurtigruten voyage to learn more about the Arctic night sky as well as the greatest light show on Earth, the Aurora Borealis. We are delighted to offer nine dates for the Hurtigruten Astronomy Voyage in 2019 and 2020 accompanied by renowned astronomers Ian Ridpath, Dr John Mason and Graham Bryant. Through a series of lectures and a guided tour of the night sky from the deck of the ship, your lecturer will bring the world of stars, planets and meteors closer whilst also exploring the numerous myths and legends linked to the constellations in our skies. An Applied Physicist by profession, Dr John Mason has been actively involved in Science for over 30 years, with Astronomy, Astrophysics and Space Technology as his main interests. He is currently Principal Lecturer at the South Downs Planetarium in Chichester, has been a Fellow of the Royal Astronomical Society since 1976, and is a full member of the International Astronomical Union. He lectures extensively in the UK and overseas on a wide range of scientific topics and is a frequent broadcaster on radio and television, having appeared many times with Sir Patrick Moore on BBC TV's 'The Sky at Night. Graham Bryant is chairman of the Clanfield Observatory in Hampshire, which is the largest amateur observatory in the UK. He is a Fellow of the Royal Astronomical Society and part-time presenter at the South Downs Planetarium. He also mentors the final year astronomy module at the University of Plymouth. All above prices are in £s per person, for your Hurtigruten voyage based on two people travelling together and sharing a twin cabin. Suites and Mini Suites are available on request. • Hurtigruten voyage Bergen-Kirkenes in cabin grade of your choice including full board. • Entrance to the Hurtigruten Museum. • Tour manager and lectures. Prices may change at any time prior to booking. The 'from' price is the cheapest fare available. As cabins get booked up, the fares will increase to the 'to' fare. The applicable price will be quoted at the time of booking. Board your Hurtigruten ship in Bergen, the cultural gateway to the fjords. Enjoy the relaxed ambience of life on board and take the opportunity to meet your fellow astronomers.